The year is 1617, and the only thing on the minds of every noblewoman and aristocrat in Europe is CHOCOLATE. The act of eating this modest confection brings so much PLEASURE, it has become more prized than tea, spices, even liquor ... and it all comes from one place: LUCIA DE CASTILLO’s factory in northern Friesland. This one businesswoman has Europe by the balls, and some will pay handsomely for the secret to her success. But Lucia’s factory isn’t what it seems to be. The horrors and cruelties that exist within its walls defy IMAGINATION ITSELF. Nobody ever goes in ... and nobody ever comes out! 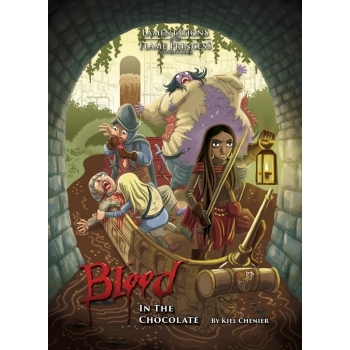 BLOOD IN THE CHOCOLATE is a psycho-sexual romp that pits characters not just against their enemies, but against their own twisting, melting, inflating, or poisoned bodies. This adventure comes from the imagination of Kiel Chenier (Dungeons & Donuts, The Hell House Beckons), brought to life by the lurid illustrations of Jason Bradley Thompson (Mangaka: The Fast & Furious Game of Drawing Comics, Dreamland).